I was drawn to this book after joining an amateur choir that will be performing the Requiem in its entirety, and am reading it with the eyes of a layperson, neither academic nor musicologist. From that perspective I found the book extremely illuminating. I believe it will also interest other general readers, though some familiarity with Mozart's biography and a general understanding of musical terminology will definitely help substantially. 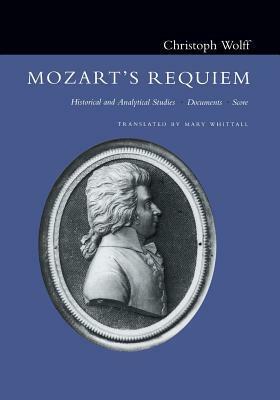 The book is divided into four principle divisions: an analysis of the problems pertaining to our understanding of the Requiem's history and authorship, a short musicological analysis of the mass, a collection of historical documents pertaining to its composition, and a copy of the score that Mozart left behind, along with Süssmayr's score. With respect to the problems of authorship, the basic facts are well-known. The Requiem was anonymously commissioned by Count Franz von Walsegg, who desired a suitable mass to memorialize his recently-departed wife. He presumably acted in secret in order to abet his proclivity for passing off commissioned works as his own. Mozart fell ill during its composition and died, leaving a partially-completed score and sundry "scraps of paper" with notes for the uncompleted sections. The widow Constanze, desperately needing the balance of the commission, persuaded Mozart's student Franz Xaver Süssmayr to complete the work. What we now possess are Mozart's autograph in a substantially uncompleted state, and Süssmayr's work. What we lack are the scraps of paper, so it is now a matter of conjecture how much Süssmayr contributed to the remaining sections. It is generally held that the Sanctus and Agnus Dei are nearly entirely Süssmayr's, as he himself maintained, and as they are rather of inferior quality. The details of this history are surprisingly engaging on an anecdotal level, and help to bring the unique character of this work into focus. It is widely held that Mozart came to believe during his final illness that he was now writing the Requiem for himself, which may account for its rare gravity and pathos. It is the only one of Mozart's works I can easily think of that is devoid of whimsy. The musicological analysis is extremely illuminating, and I particularly benefited from Wolff's exposition of the relationship between the music and the text. I did not spend much time with the last two sections, which are resources primarily provided for specialists. It's interesting to scan through the historical documents, though. My purpose was to get inside the Requiem, and Wolff's book enabled me to do that. It was a pleasure to read. Sign into Goodreads to see if any of your friends have read Mozart's Requiem.